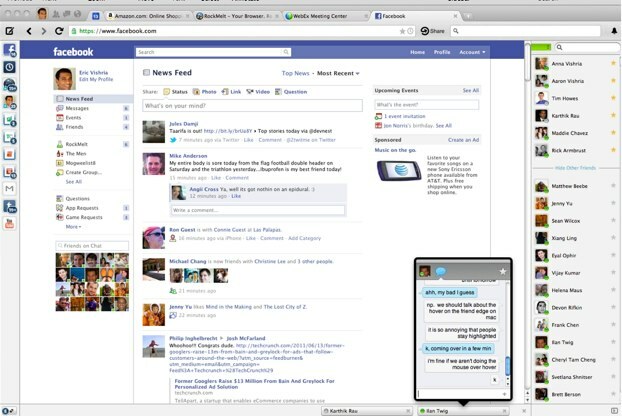 Ever since RockMelt launched its social browser, it’s been known unofficially as the Facebook browser. Facebook chat, status updates and sharing are all built right into the browser. Now Facebook and RockMelt are officially working together in a product partnership, and the first fruits of that collaboration can be seen in the latest release available today, RockMelt 3. RockMelt is still an independent browser with only a few hundred thousand active users. Facebook made no investment in RockMelt, nor is it going to help promote or distribute the browser, at least initially. Its product teams, however, are working closely with RockMelt to make sure that its Facebook features shine. “The partnership is based on a shared belief that social should join navigation and search as fundamental capabilities of the browser,” says RockMelt CEO Eric Vishria. There are several new features in RockMelt 3. To start with, RockMelt 3 adds Moves your Facebook buddy list from the left edge to the right edge of the browser. The buddy list is now scrollable, and it can be expanded to view not just pictures of your friends’ faces, but their full names. The second new feature is that Facebook notifications, messages, and friend requests—what Facebook engineers internally call “the jewels”—are now visible at the top of RockMelt right in the chrome itself. You can visually see when you have a new notification, friend request, or message, and pop down a window to read more. RockMelt is now integrated with Facebook’s unified messaging system. So if a contact is online, a chat window pops open. If he or she is not, it reverts to Facebook messages. RockMelt also knows when you are on Facebook.com, and strips away the redundant features from the site which are part of the browser. So the notification counters at the top pf Facebook disappear because they are now a feature of RockMelt. And when you are on Facebook.com, and a friend wants to chat, RockMelt’s version of Facebook chat opens up instead of two chat windows duplicating each other, which is what happened before. So far, RockMelt has not taken off as much as its initial launch hype would have suggested. Since it opened up its beta to the public in March, it’s seen modest growth, but high user engagement. A Facebook endorsement could help its cause. So did Marc Andreessen, who is both a Facebook and RockMelt board member, have anything to do with this partnership? Not initially. “Someone on Zuck’s staff was an alpha user—one of our first 100 users—he showed it to Zuck and that is what got the partnership going,” Vishria tells me. Certainly, it is not too difficult to imagine why Facebook would be interested in supporting the development of a social browser.